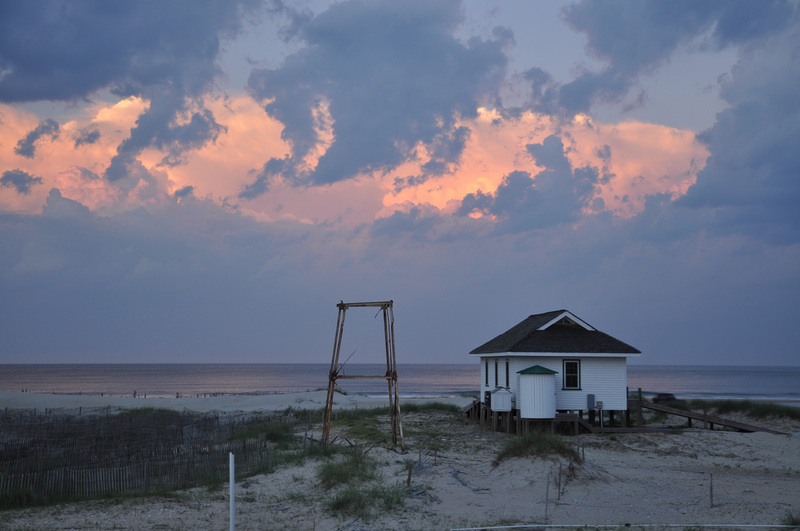 The preservation efforts of the entire Outer Banks serve to connect us to our heritage and serve to tell the stories of how we came to live in this wonderfully historic, fragile, and unique place many of us call home. 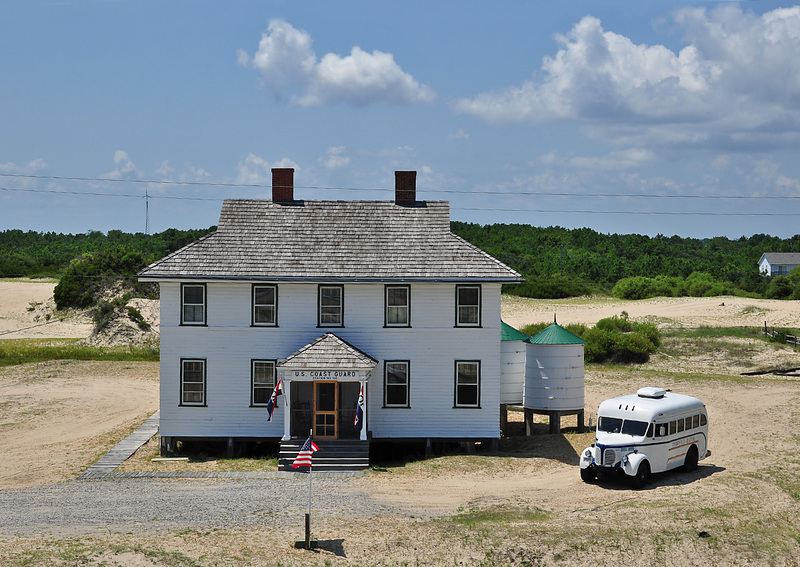 Watch a video on the historic preservation of Wash Woods and Kill Devil Hills Live-Saving Station. At first glance, one immediately senses that this structure has an extraordinary story. 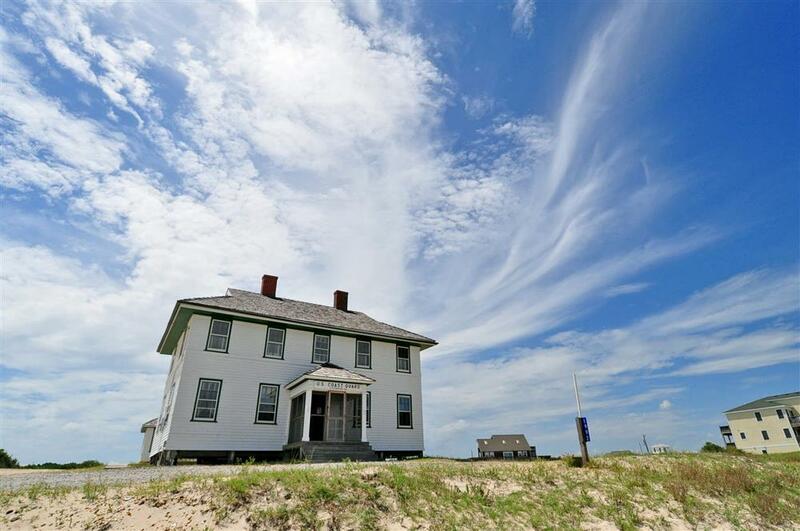 Situated just off the oceanfront in North Swan Beach in the 4x4 area, Wash Woods Station looks strikingly different than neighboring modern homes. This historic building and its surrounding outbuildings were purchased by the Twiddys in 1988 and restorations were completed in 1989. Beautiful blue skies over the Wash Woods building, serving as a Twiddy Sales Office today. 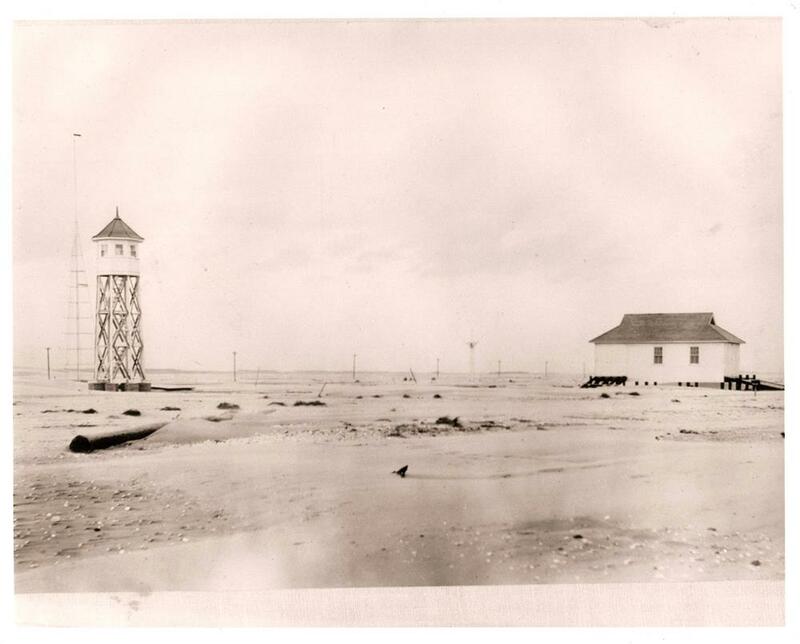 Photograph of the now present lookout tower, boathouse and cisterns. The boathouse serves as a private building for the Twiddy family. 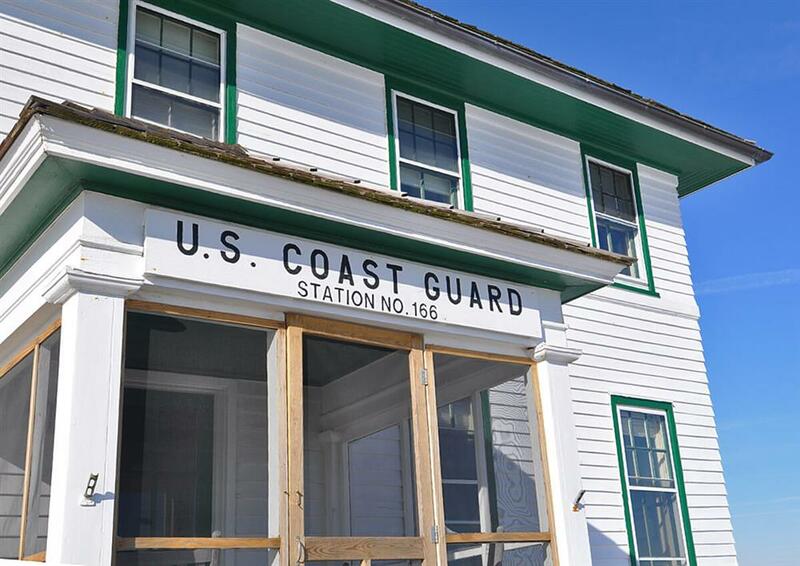 Wash Woods Station was built by the United States Coast Guard in 1917 to replace an older, outmoded station a few miles north. 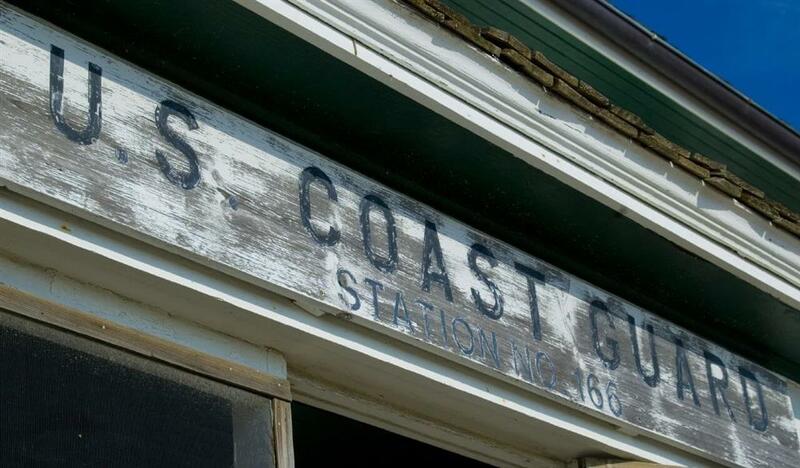 The Lifesaving Service erected the original station, known as Deals Island Station #6, just south of the VA border in 1878. The first Officer in Charge was appointed on December 9, 1878 and three weeks later on January 1, 1879 the first crew was engaged. By 1883, the station was renamed Wash Woods for a small village that was located just north of the VA border. * In 1914, the Federal Government claimed title to the land occupied by the station. 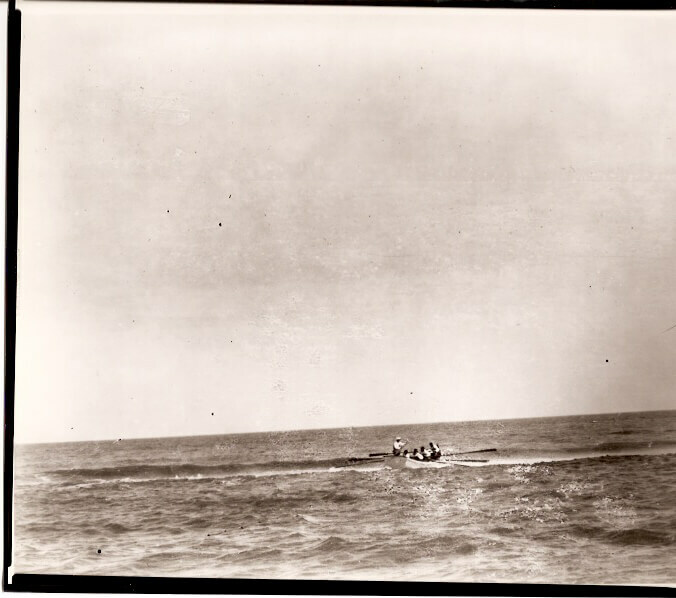 In 1915, the US Lifesaving Service merged with the Revenue Cutter Service. The new organization was named the United States Coast Guard. Wash Woods was numbered #166 in the chain of stations along the Atlantic coast. 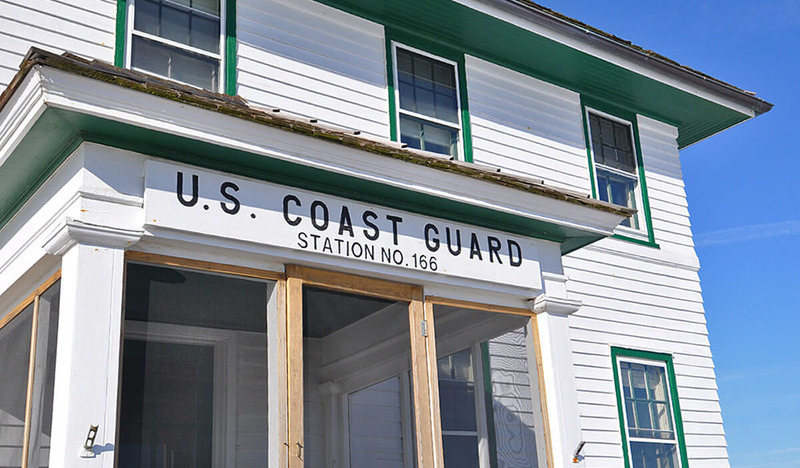 Original Sign found on the Wash Woods Coast Guard Station. Revamped Wash Woods Coast Guard sign. Built in an architectural style referred to as Chatham style, Wash Woods was constructed according to plans drawn in 1914 by architect Victor Mendleheff. The original main building consisted of eight rooms and two bathrooms. A separate galley was situated just to its west, and a pair of cisterns was built on the northwest corner of the station. The cisterns were used to gather rainwater from the roof and served as the guardsmen’s water supply. 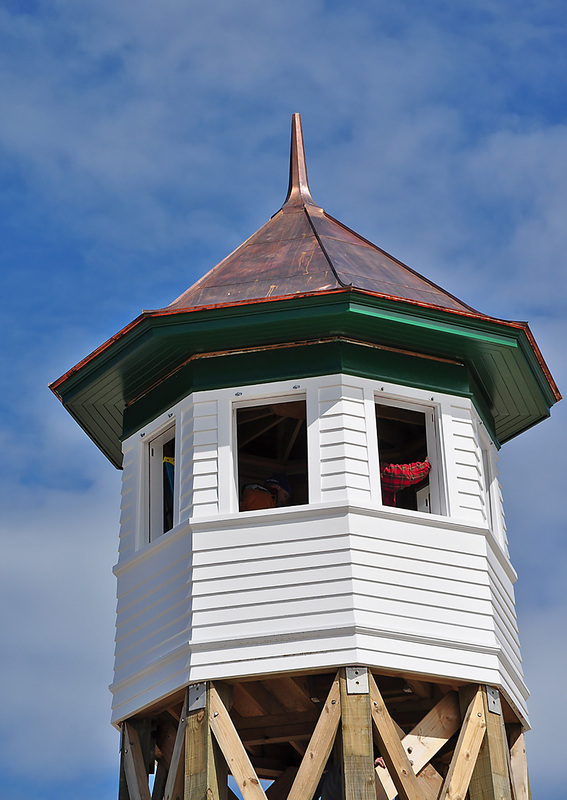 A small lookout tower was built on the oceanside of the station. 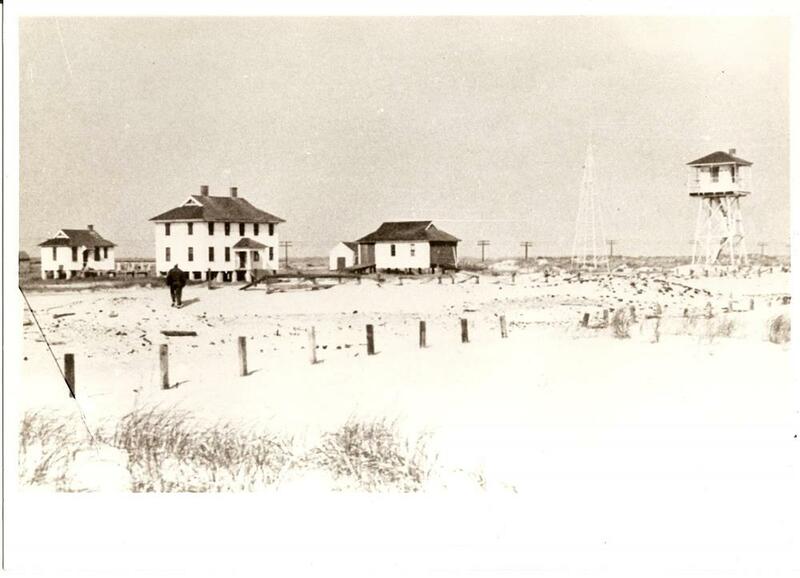 Image of the original Wash Woods structures; including the main coast guard station, cooks kitchen, boathouse and tower. Photo of barn originally found behind the cook’s kitchen of Wash Woods. Original boat house and tower built in 1918. During its years of active duty, Wash Woods Station housed many guardsmen who performed countless brave rescues. 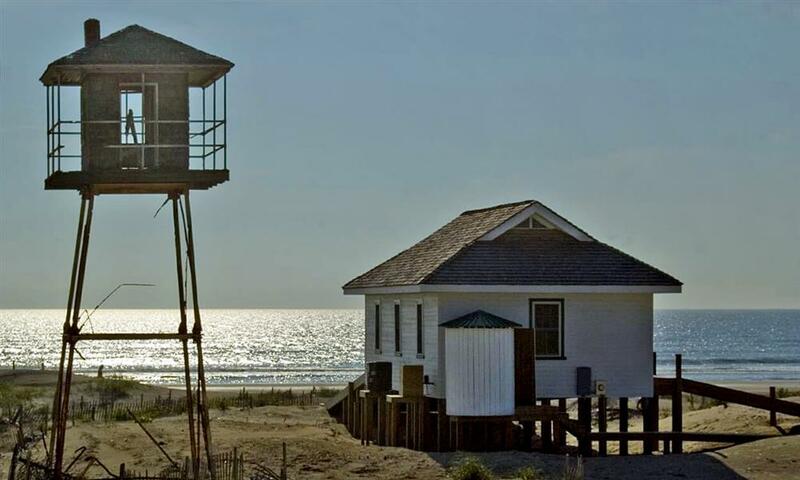 With German U-boats thick off the coast during World War II, Coast Guard stations along the Virginia and North Carolina shores prepared for conflict. At this time, Wash Woods was home to about 30 guardsmen. 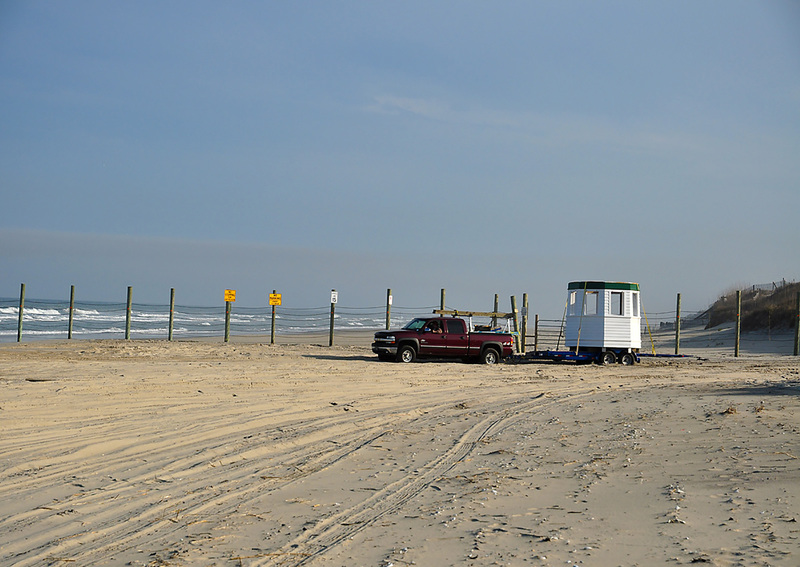 The lookout tower was constantly utilized and armed patrolmen strode the beach searching for signs of the enemy. After the war, the need for personnel decreased and crews were reduced. Wash Woods reverted back to standard pre-war-sized crew until 1949. Records indicate that the station remained active from thereafter with only a single caretaker until officially decommissioned in late 1954 or early 1955. Surfmen out to sea practicing drill. Lifesavers photographed on boat. Picture taken at a station other than the Wash Woods Coast Guard station. In the years to come, Wash Woods Station served as a private vacation home. In 1988, the owners approached Doug and Sharon Twiddy to see if they would be interested in purchasing the station. 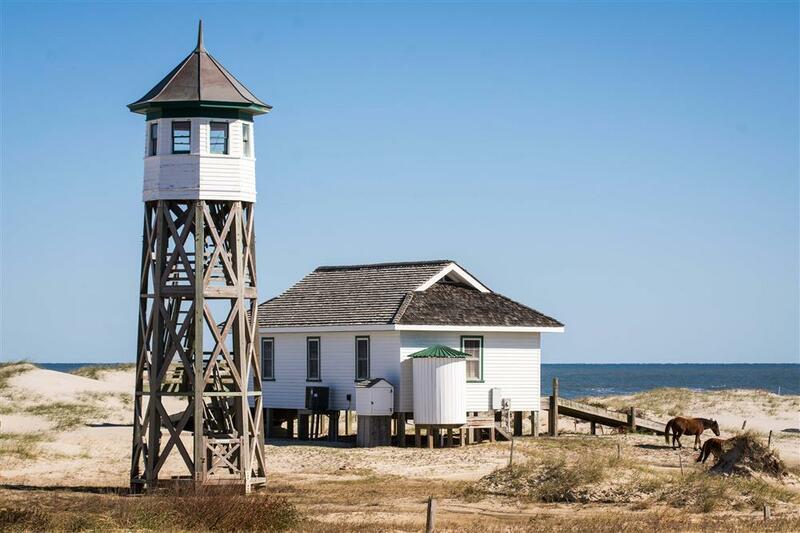 They had heard of the Twiddy’s restoration of the old Kill Devil Hills Lifesaving Station and thought Wash Woods may also be of interest. 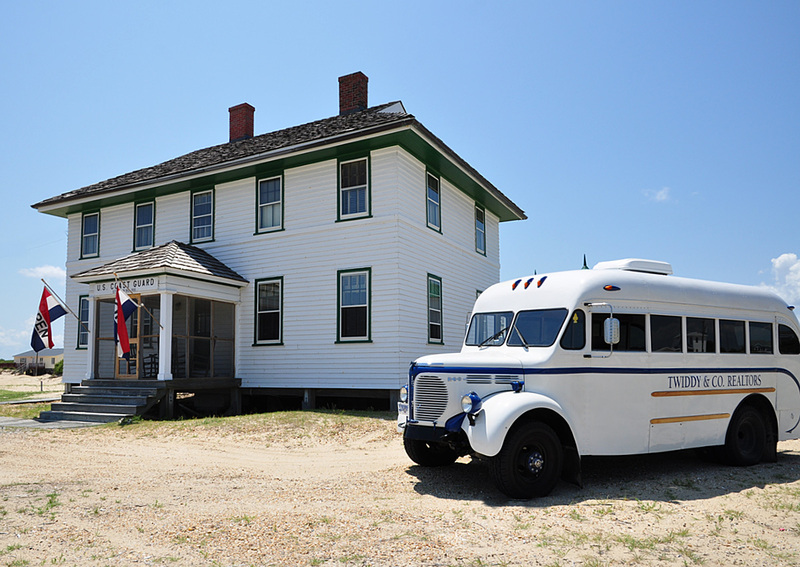 The Twiddys were happy for the opportunity to ensure the future of another historic Outer Banks landmark, and began the process of transforming the station back to its authentic state soon after the purchase. 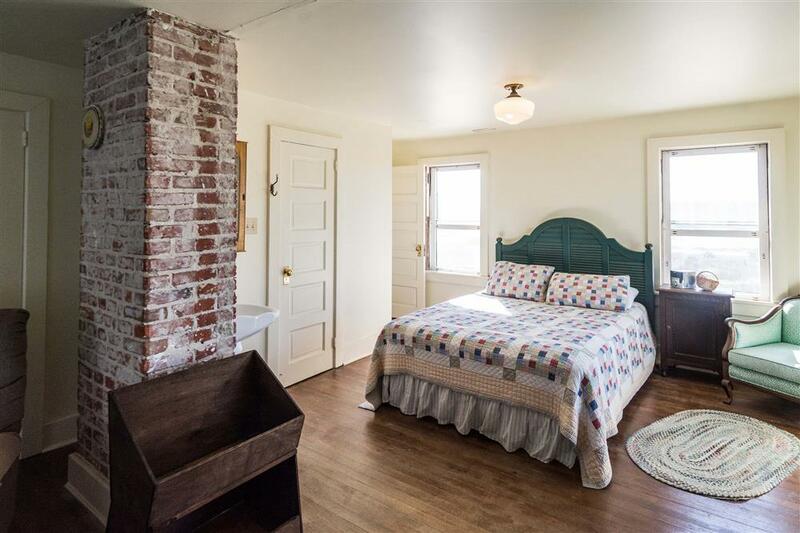 The sale included the original main building, cisterns, kitchen, lookout tower and chicken coop. 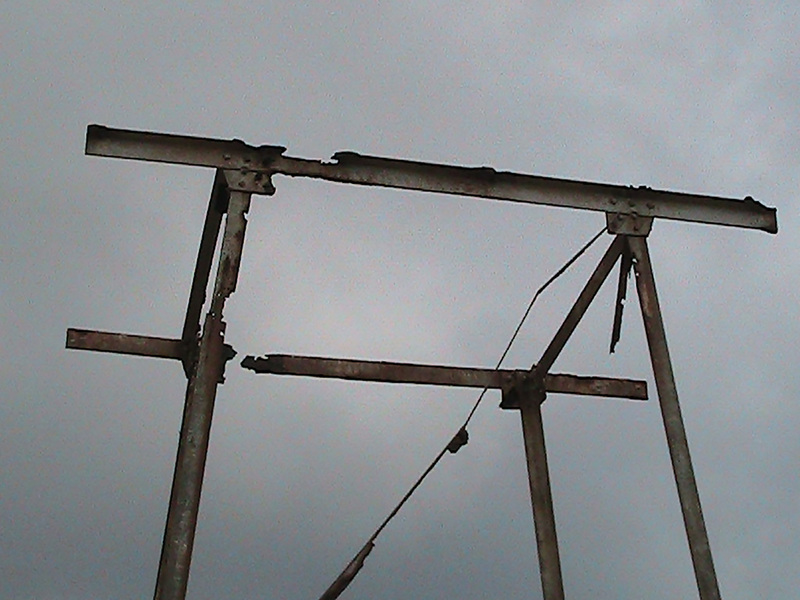 Concrete pilings were all the remained of the original flagpole and radio antennas. The stable, which was situated on a nearby lot, was not part of the sale and later fell. This photograph shows the Wash Woods building being lifted in the early ‘90’s. The structure was raised 10-12 feet from it’s original height. This building and the lookout tower were originally the same height. When the Twiddy’s purchased the building, sand was covering a larger portion of the building and entry was only possible through several windows. The first order of business was to move the dune that shifting sands had built up around the station. 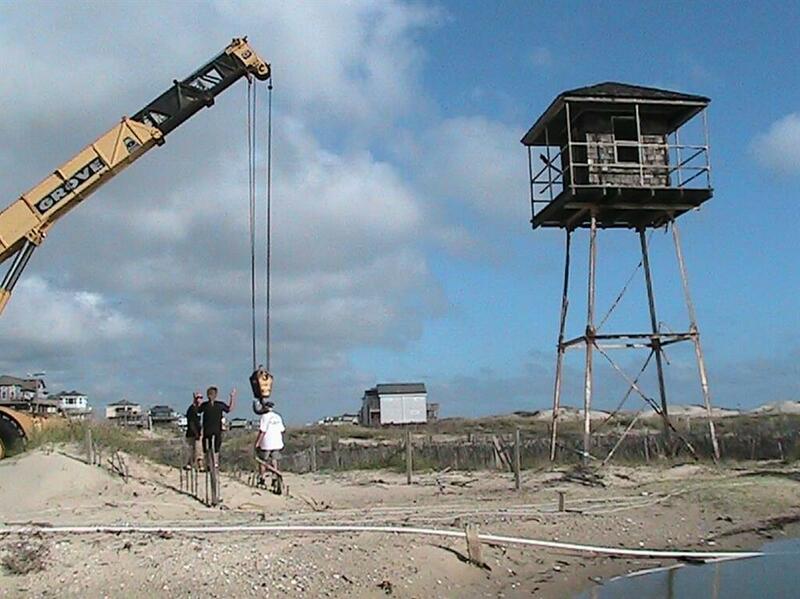 The main building was lifted and set on wood pilings. Those involved in this process estimated the heart pine structure weighed a whopping 50 tons. 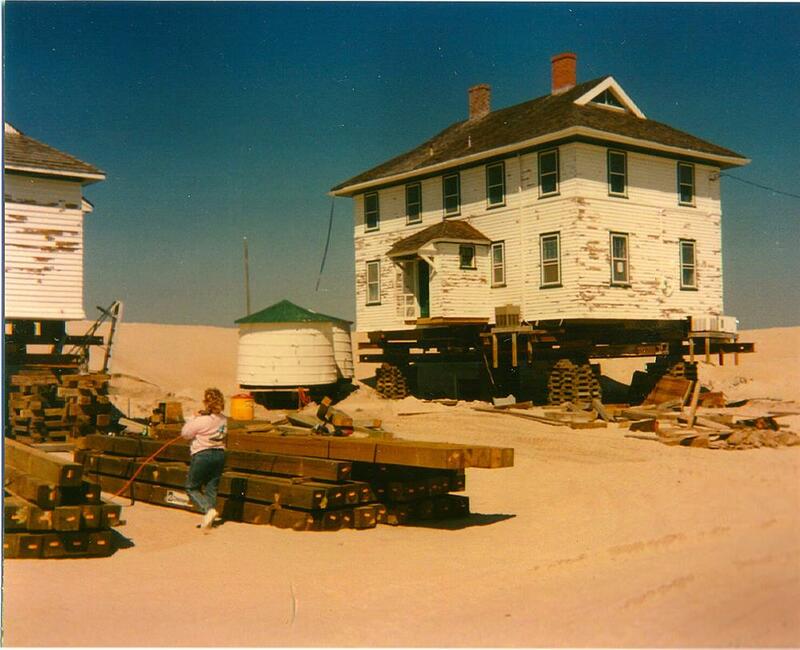 The dune was leveled, and Wash Woods was lowered back down, coming to rest 12 feet higher than its original position. The bones of the building guided additional restorations. As modern wood paneling was pulled away from the walls, the original plaster revealed itself. Carpet was stripped to unveil the original heart pine floors. Walls were decorated with a collection of old photos of Wash Woods and Coast Guard memorabilia. The only adjustment made that was a departure from the station’s original state was to add a bathroom and remove a wall on the second level, creating a master suite. Interior restoration of the main Wash Woods building was done in the early ‘90’s. 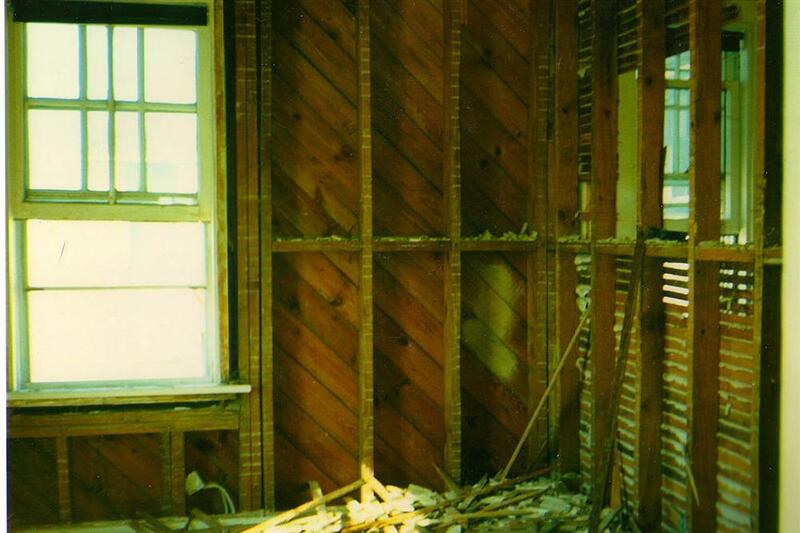 This shows the beginning of restoration of a room in Wash Woods that now serves as a Twiddy sales agent’s office. Southeast room in the main building of Twiddy Wash Woods sales office. Interior restoration of the building’s began in the early ‘90’s. The exposed brick, photographed above, was covered with plaster when the process began. The Twiddy’s tailored certain parts of the home to meet their needs. The larger upstairs master bedroom was originally two rooms divided. The wall was removed to make one larger master bedroom. 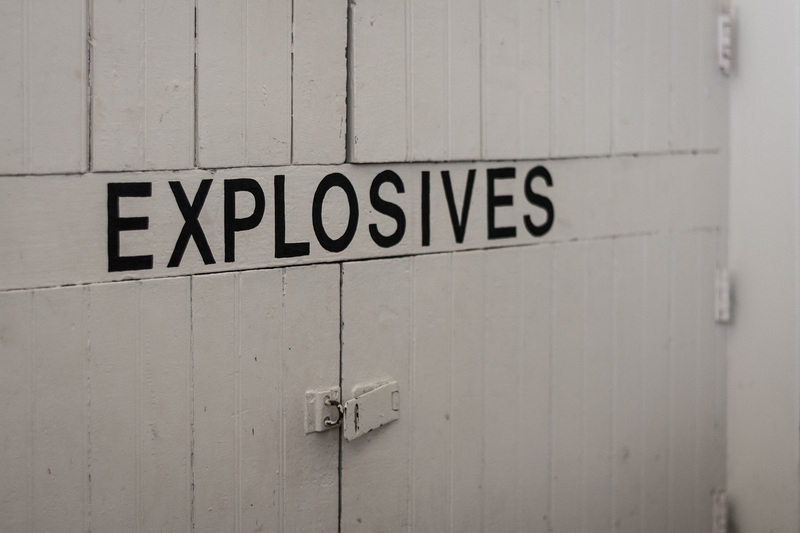 Explosive/Ordinance closet found inside the Wash Woods sales office today. This closet was not original to the station but was an original feature added in the 30’s prior to WWII. When restorations were completed in 1989, Wash Woods was used as a real estate sales office. The real estate market crash later eliminated the need for an office on the 4x4 Beaches, and the Twiddys then placed the station in their property management program. 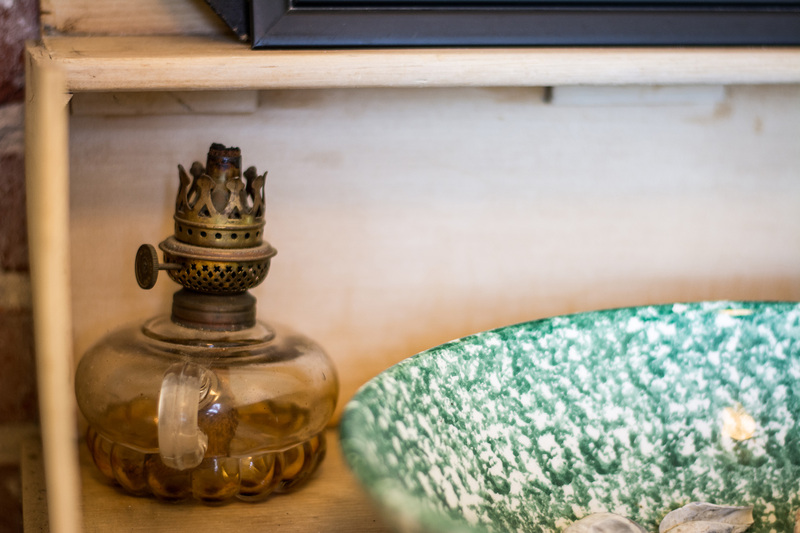 Adventuresome vacationers were provided the opportunity to trade in some of the more plush amenities offered by newer homes to experience the rustic beauty and historic character of Wash Woods. Wash Woods was later used privately by the Twiddys. They remember curious vacationers knocking on the door and asking for tours, assuming that surely this old structure was a museum of some sort. In 2007, the Twiddys rebuilt the boathouse in the likeness of to the original structure, 150 feet from its original footprint. 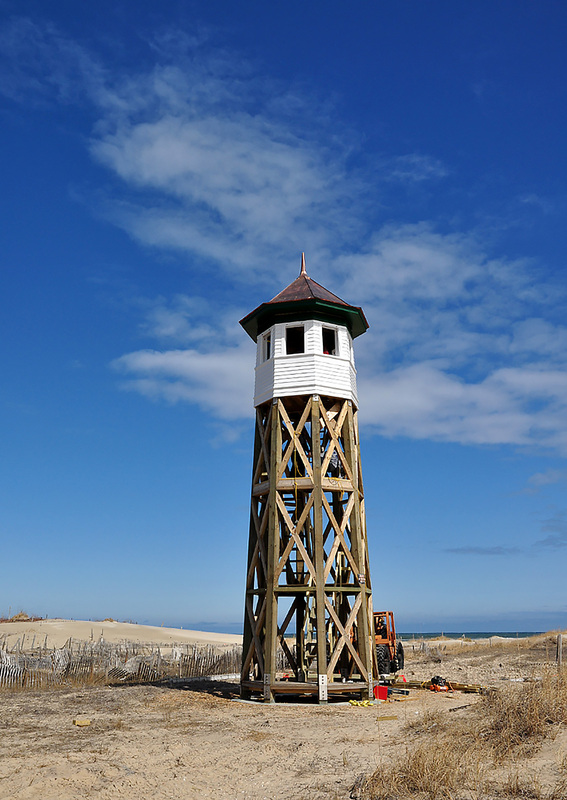 In 2008, the cisterns were rebuilt and steps were taken to begin building a replica of the original lookout tower. Photo taken May 10th, 1930. Original boathouse structure facing West. 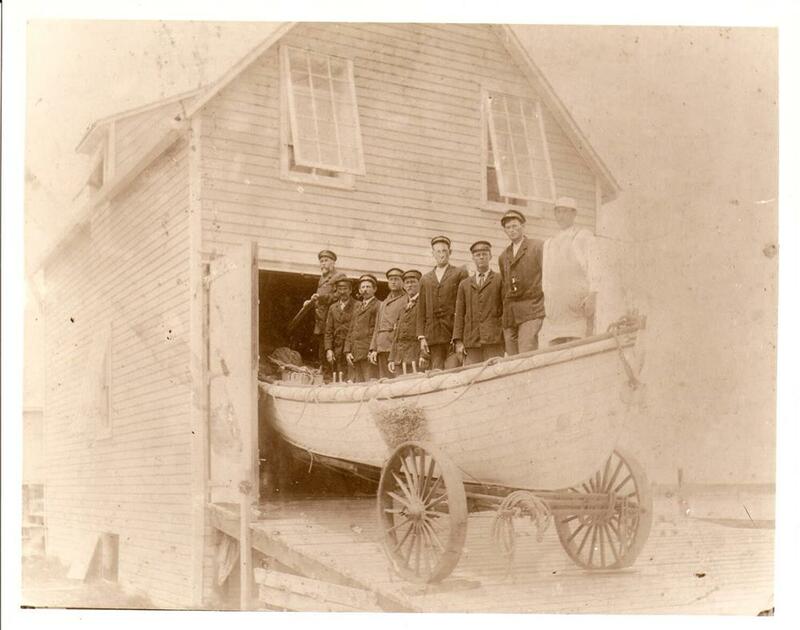 The boathouse was originally further East and closer to the ocean than it is today. Photo of Wash Woods boat house and cisterns. What stands today is a reconstruction of the building. The 1935 cisterns were much larger in diameter than the originals. The original tower was built in 1917, and destroyed by a hurricane in 1933. After finding the plans from archives in Washington DC, a replica was completed in 2011. The new tower took master craftsman, Chris Thompson, over a year to create. Pre-existing tower drawn from 1935 plans. Many folks theory is that the massive hurricane of ‘33 knocked down the original tower and cisterns. In 1935 a much more universal tower structure, shown above, was drawn and constructed. This tower was moved to an alternate location where it remains today. 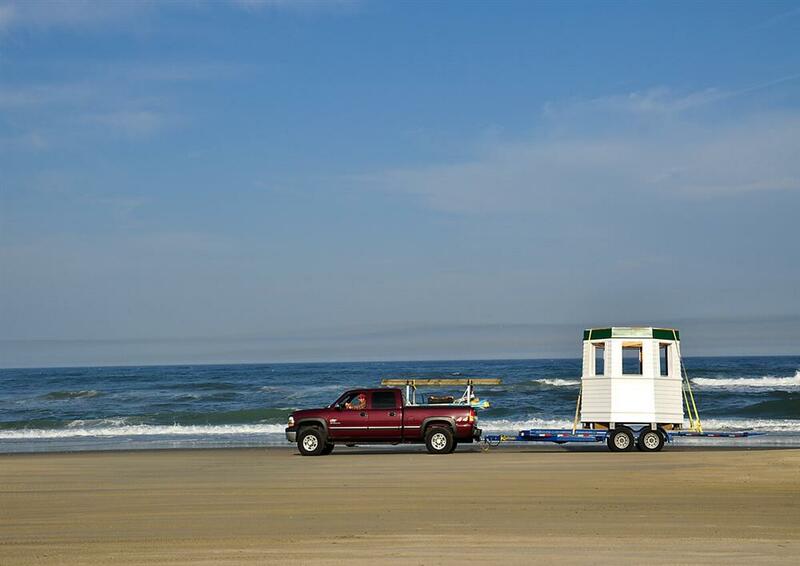 Historic Preservation Architect, Chris Thompson, headed North up the beach with tower base in tow. Chris Thompson and crew piecing together the towers new copper roof. 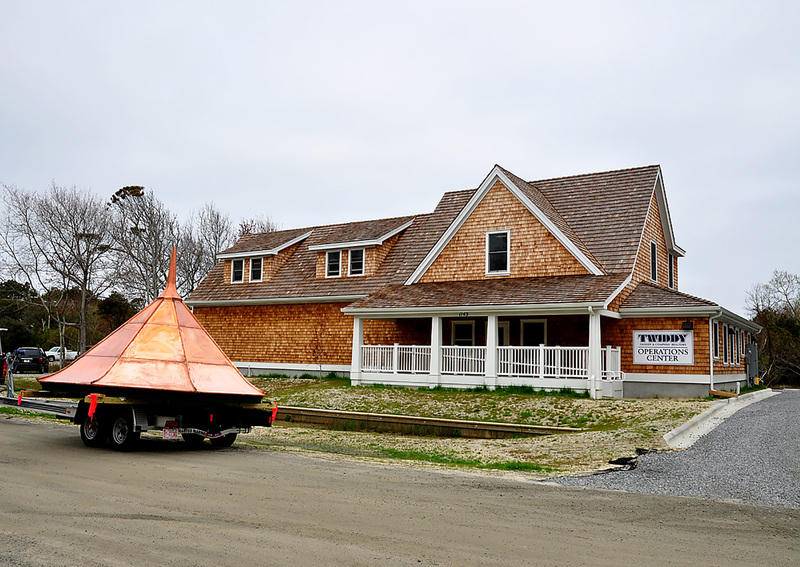 The original roof was made of galvanized steel; however the Twiddy’s chose copper to avoid rusting and deterioration. This shows the tower and boat house built from plans drawn in 1935. These were not the original plans that have been restored to exist today. This 1935 tower was moved to a private location of the Twiddy’s where it remains today. 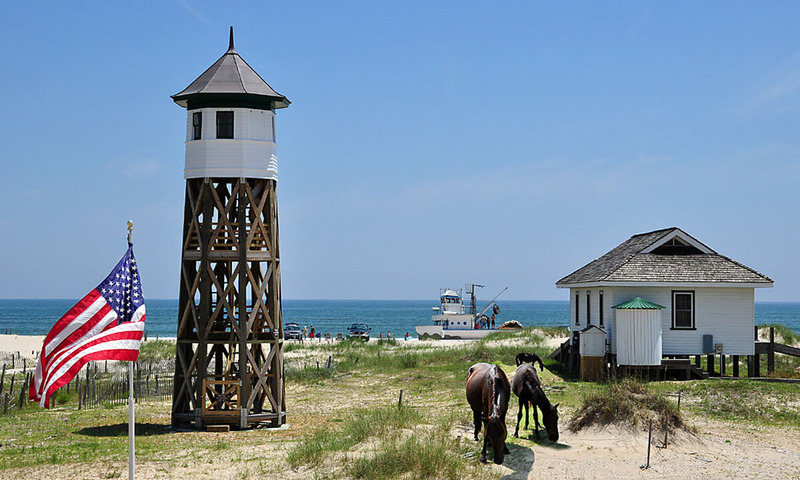 Photo taken on the Fourth of July, showcasing the lookout tower, boathouse, and wild horses roaming the area. Wash Woods has been declared by some to have a resident ghost by the name of Mose. While some – including old timers who once pulled duty in the station - claim that they have seen, heard and felt things that have made the hairs on the back of their neck stand, others suspect that Mose was created long ago as a means of keeping the station safe from thieves and intruders. 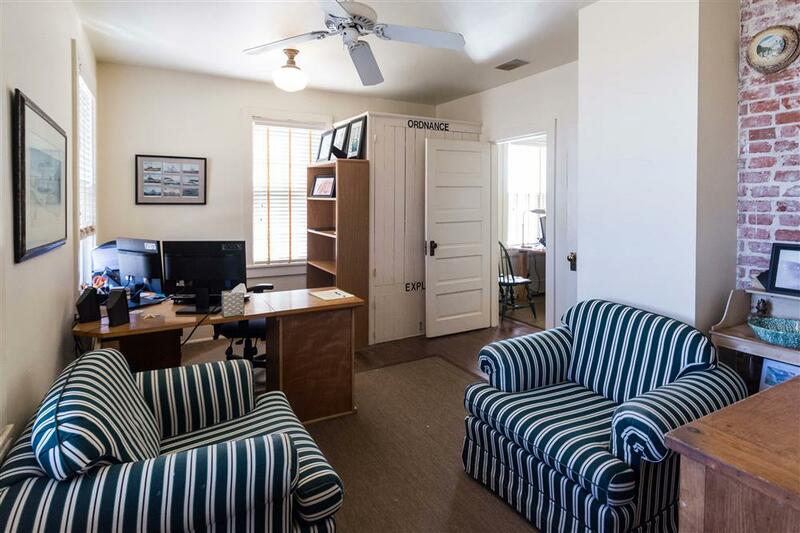 Now, Wash Woods Station serves as a Twiddy & Company real estate office once again, and the walls are decorated with a collection of old photos and Coast Guard memorabilia. Stop by for a visit and enjoy the history of this unique place. Twiddy sales office and “Reo” company shuttle. * It is believed that the Wash Woods settlement was established somewhere between 1889 and 1895 by the survivors of a shipwreck. Where this village’s name originated is debated. One thought is that the name developed from how easily a storm would wash over the dunes and into Back Bay. Another theory is that the name came from the stumps of an old maritime forest that pepper the water line at low tide. 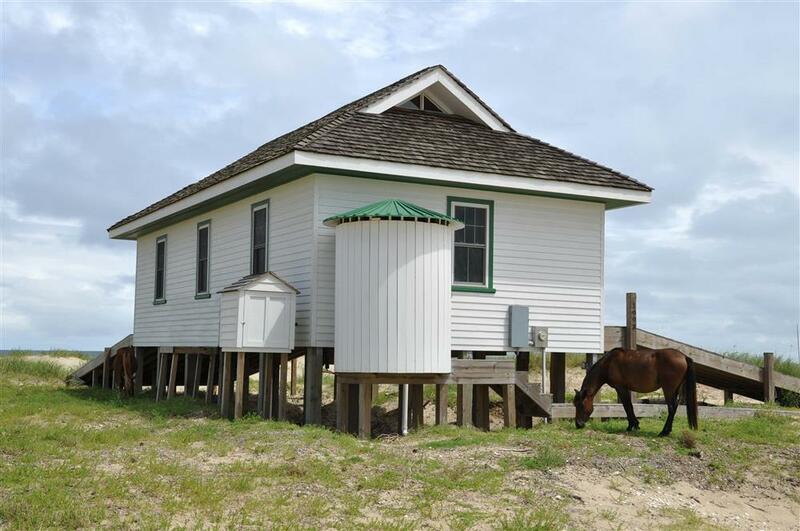 The settlers built two churches, two general stores, a school and other structures from wood that washed ashore from shipwrecks. 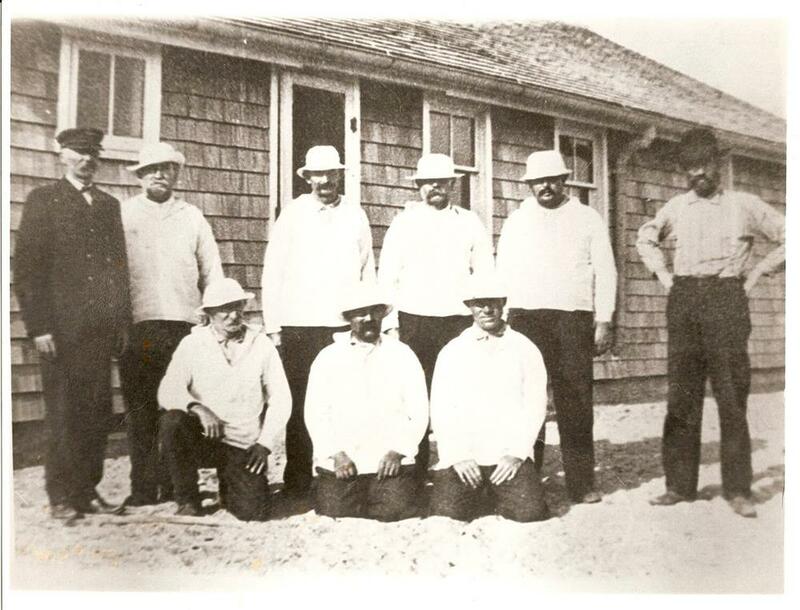 Around the turn of the 20th century, approximately 300 people lived in the village working as hunting guides, fishermen, farmers and manning lifeboats. 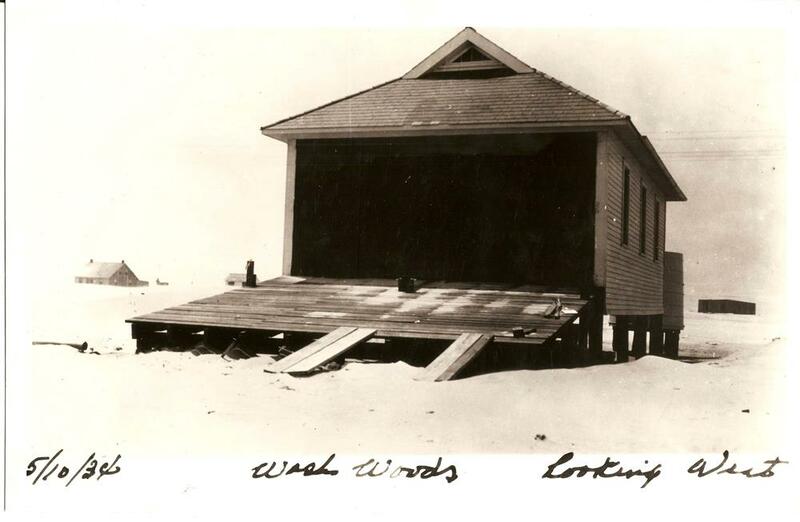 Ironically, the same harsh conditions that beached wood for the community of Wash Woods’s structures eventually drove residents away. 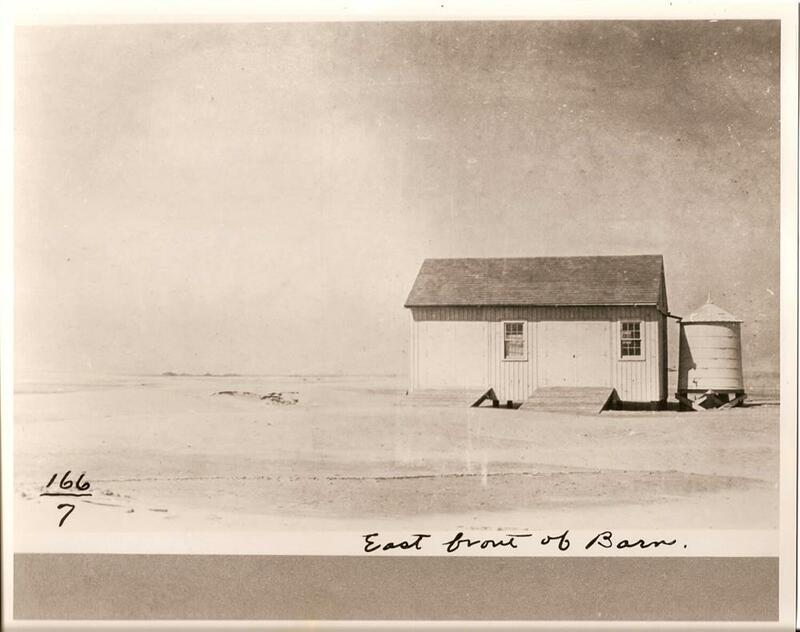 The once fertile farm land was overcome by shifting sands and live oak trees. The community of Wash Woods began to clear out in the 1920s, and was completely empty by the 1930s. Later used as hunting grounds, the area now rests inside Virginia’s False Cape State Park. Today, all that remains of Wash Woods is a small cemetery. Lookout tower present today. 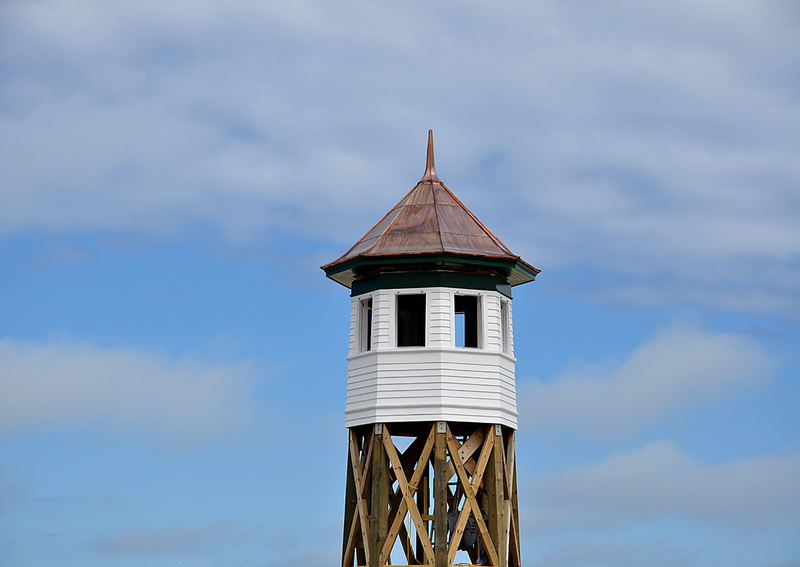 The original lookout tower was all white. Lookout tower that stands today. 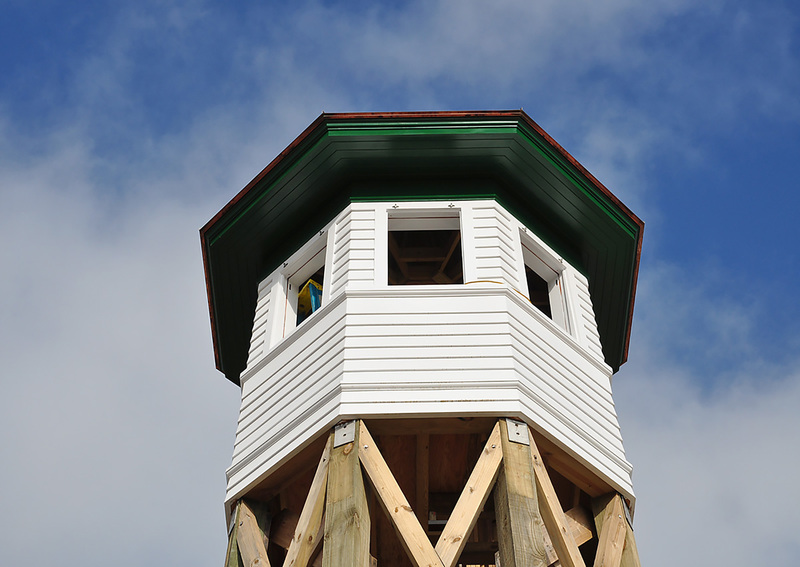 Photo of Wash Woods lookout tower. The original tower’s roof was made of galvanized steel; however the Twiddy’s chose a copper roof to avoid rusting and quick deterioration. The copper roof was replicated with the original drawings ‘swale’ architectural design. This is the curved feature found on the bottom of the roof. The towers new roof was made in two separate pieces so it could be unbolted and removed if necessary in the future. The tower was too tall to trailer in one piece and had to be transported piece by piece. 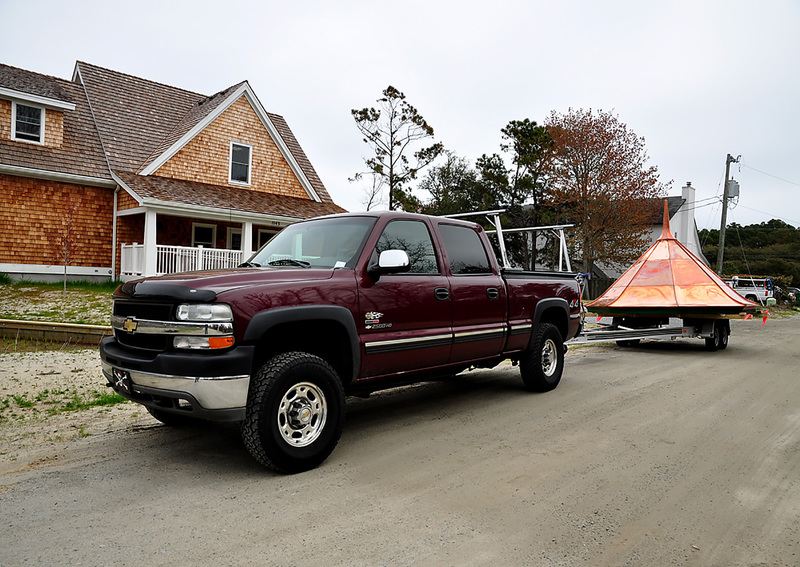 This photo shows architectural preservationist, Chris Thompson, passing by the Twiddy Owner Service’s Building en route to the Wash Woods location on the 4wd beach. 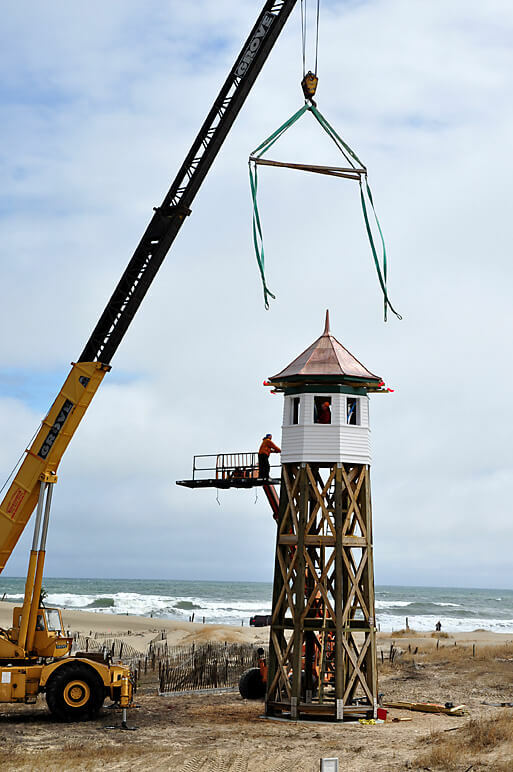 A wide load permit was needed to transport the tower, in portions, up the beach. 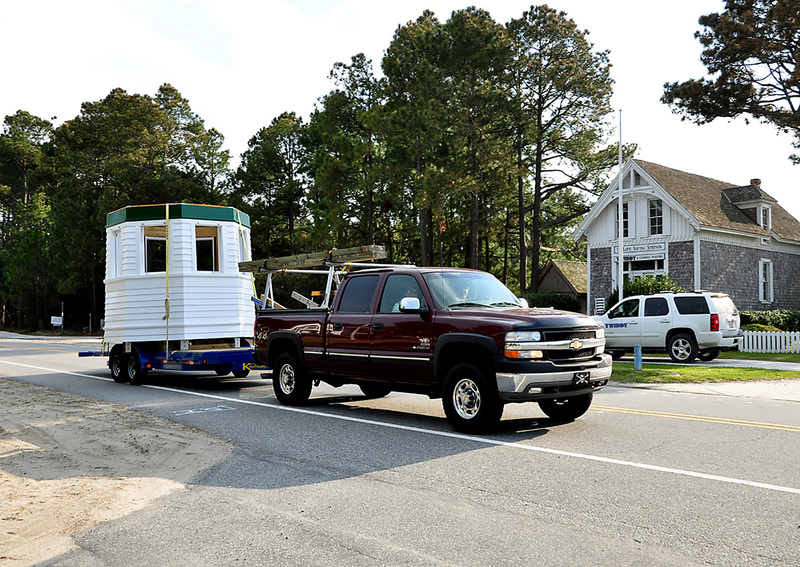 Historic Preservation Architect, Chris Thompson, transporting the base of the tower down Highway 12, past the Corolla Sales office. Base of tower being towed up the beach. 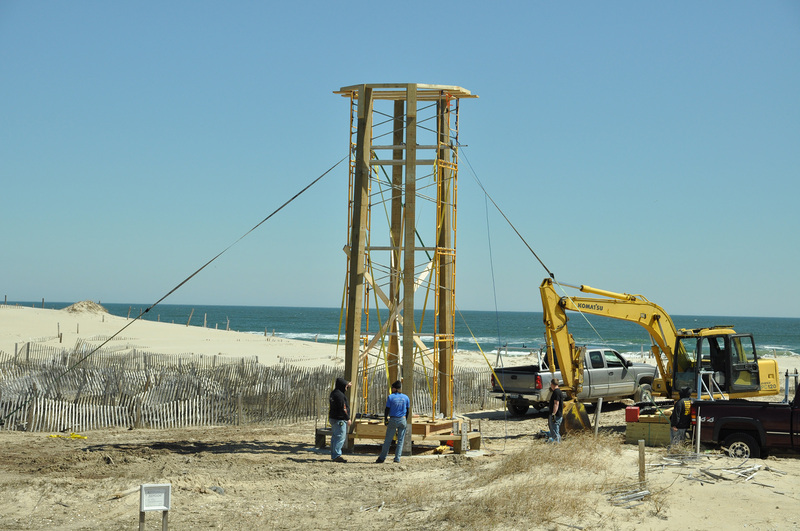 The 1918, original towers footers still remained in the sand prior to reconstruction; therefore orientation & elevation are identical to the tower originally built. 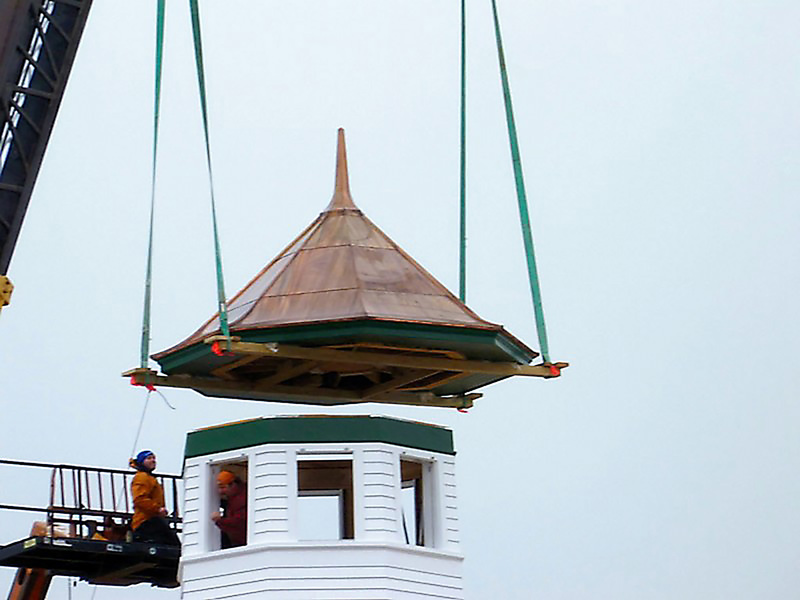 New copper roof being lifted and placed on top of the base of the tower. 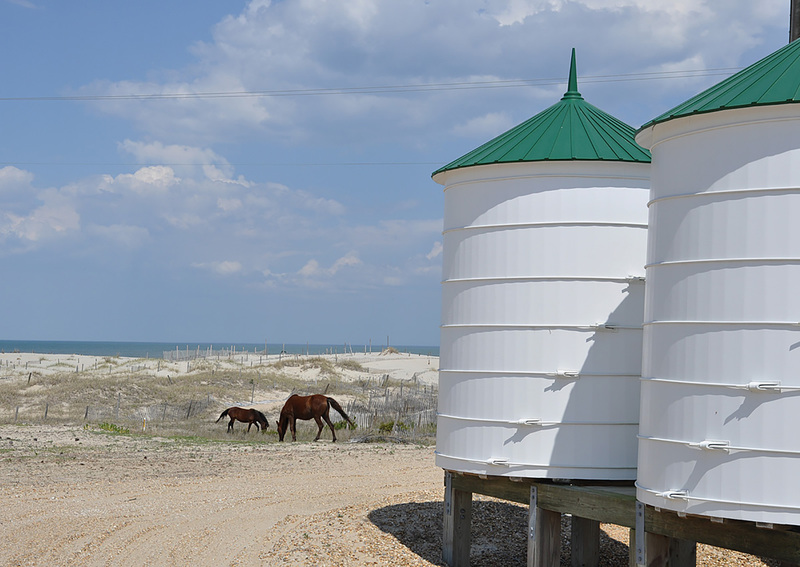 Wild horses grazing by the Wash Woods cisterns. Cisterns were all rotted with roofs missing when the Twiddy’s purchased Wash Woods. The original plans were used to provide accuracy in height & width for the reconstructed cisterns that exist today. 1935 tower base (mid-move) and boathouse captured at sunset. 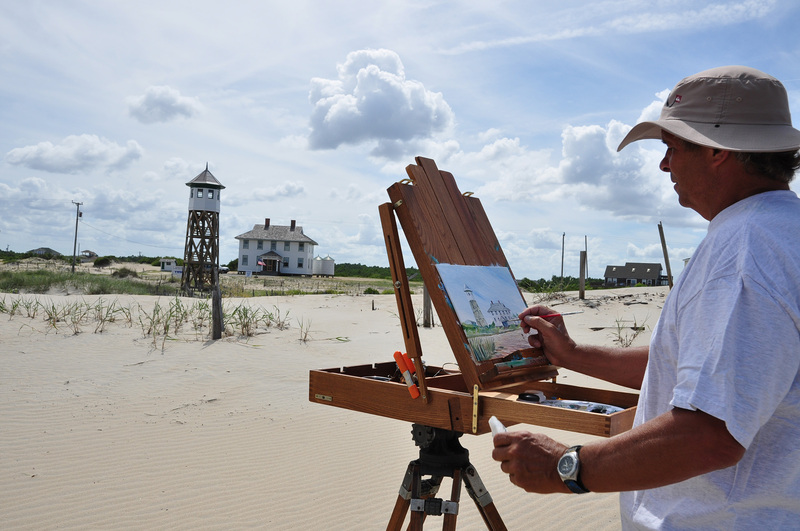 Artist, Rick Romano, on site, painting the Wash Woods station. Construction of current tower base. 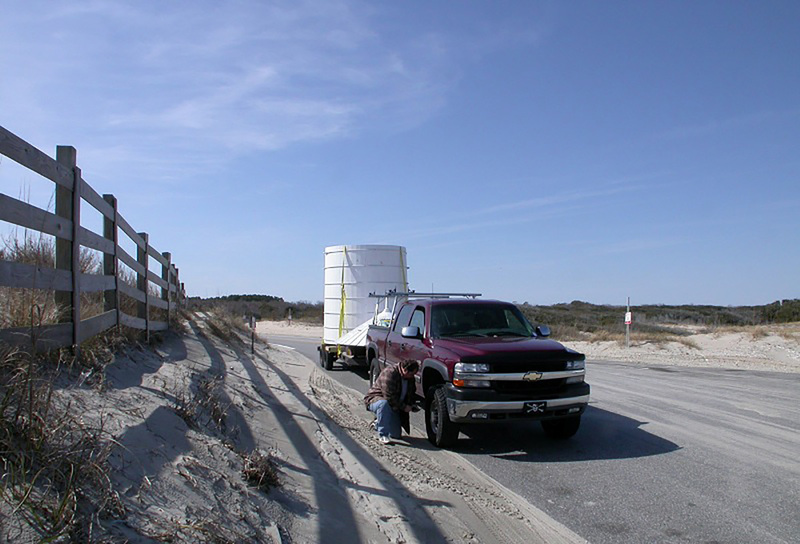 Entering 4wd beach, towing the tower’s base. 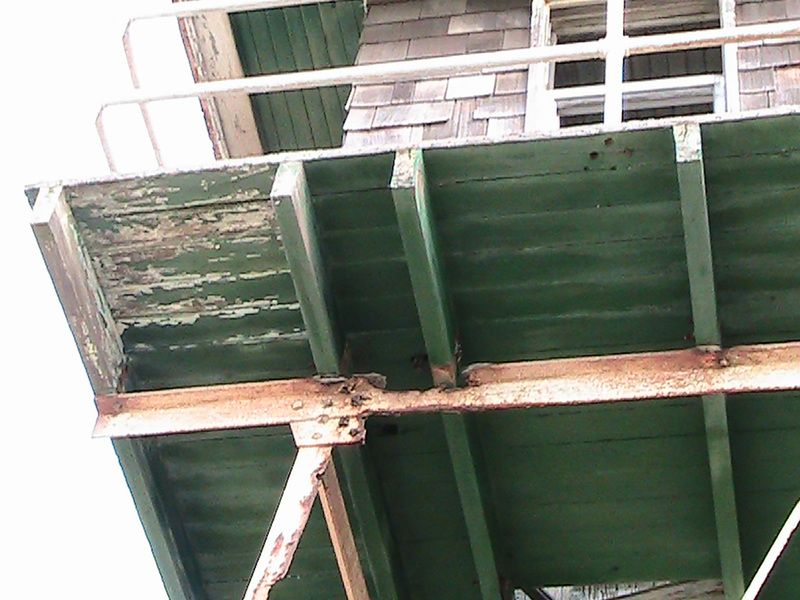 Originally a staircase on 1935 tower; however the staircase was made from galvanized steel which was rusted and non-existent by the time the tower was moved. 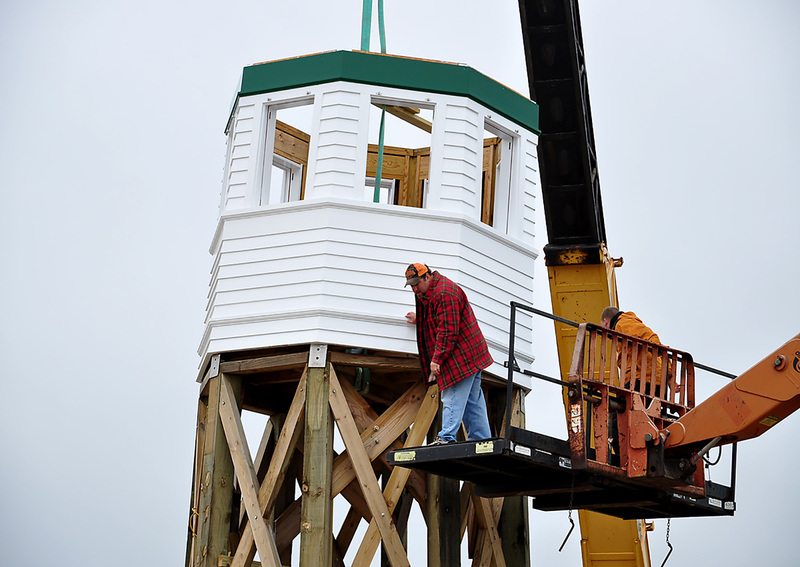 Local, Mark Thompson; along with a hired house moving company, in the process of moving the 1935 tower. Steel base of tower constructed in 1935 shown in the photo above. The footers still remain in the sand. 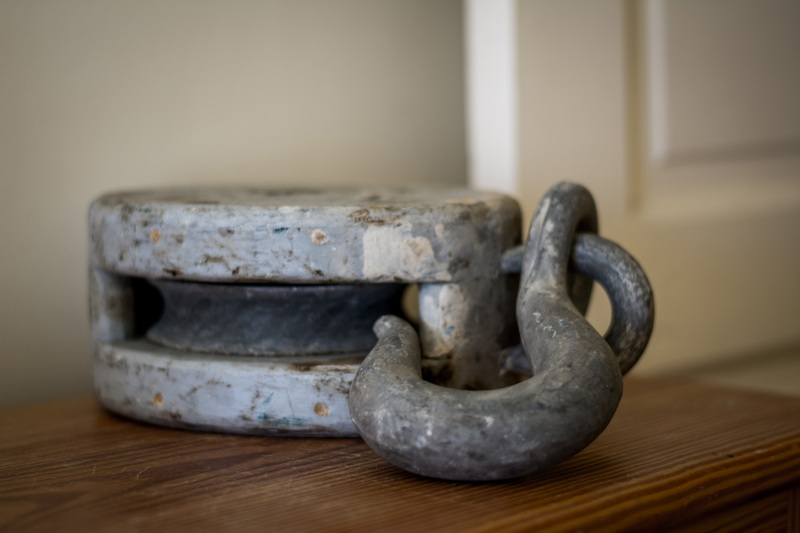 Coast Guard pulley found and on display in the Wash Woods Sales Office. 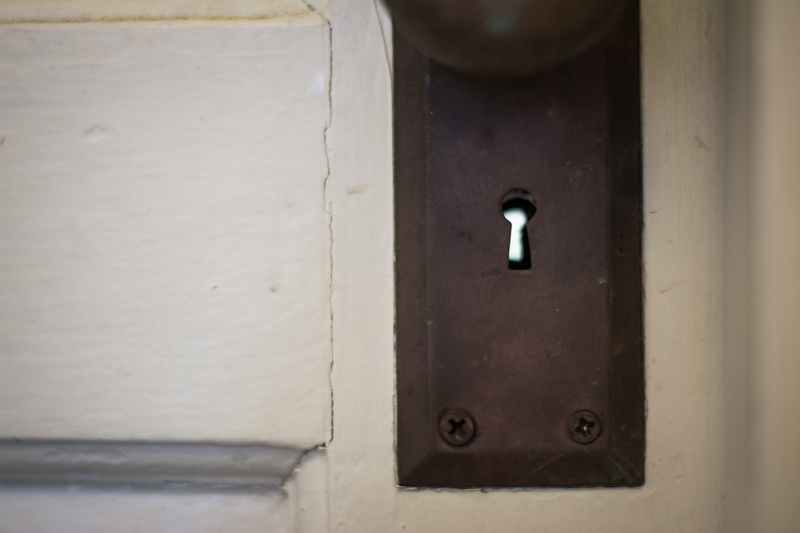 Original hardware found throughout the building. 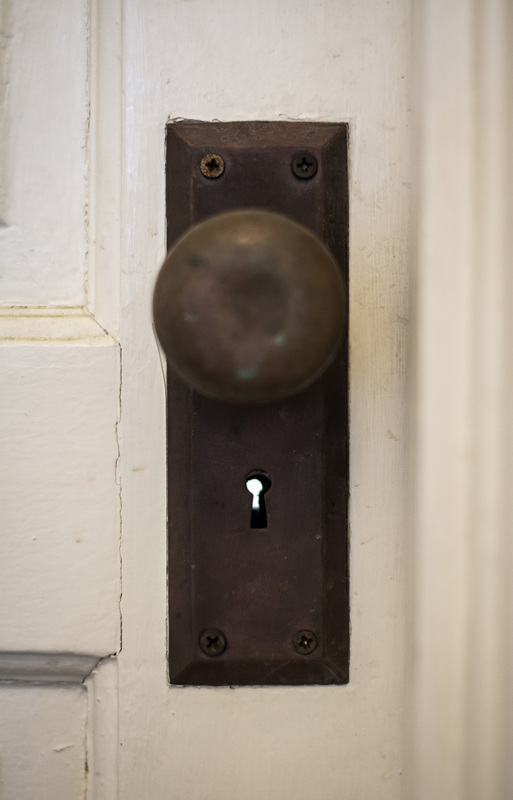 Original hardware was preserved throughout the home; including sash locks & pulleys still present on the office’s windows. 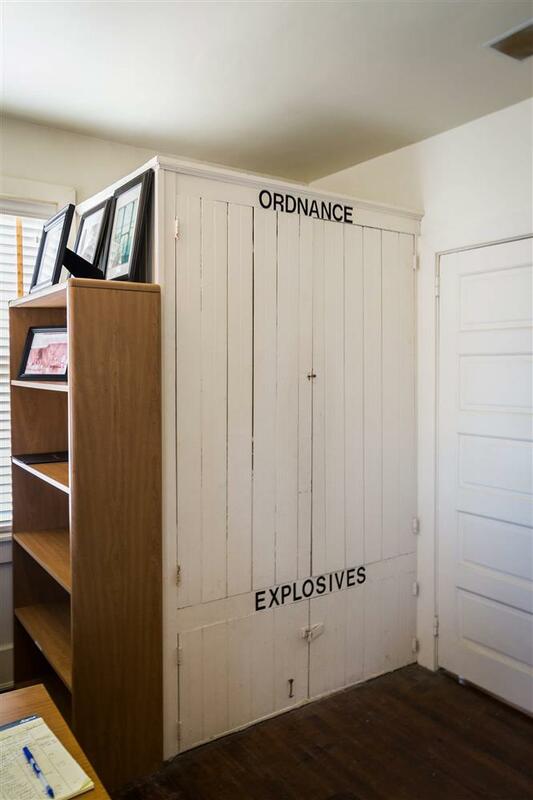 Explosives/Ordinance closet that exists today in the sales office. Not original to the station but an original feature added in the ‘30’s prior to WWII. 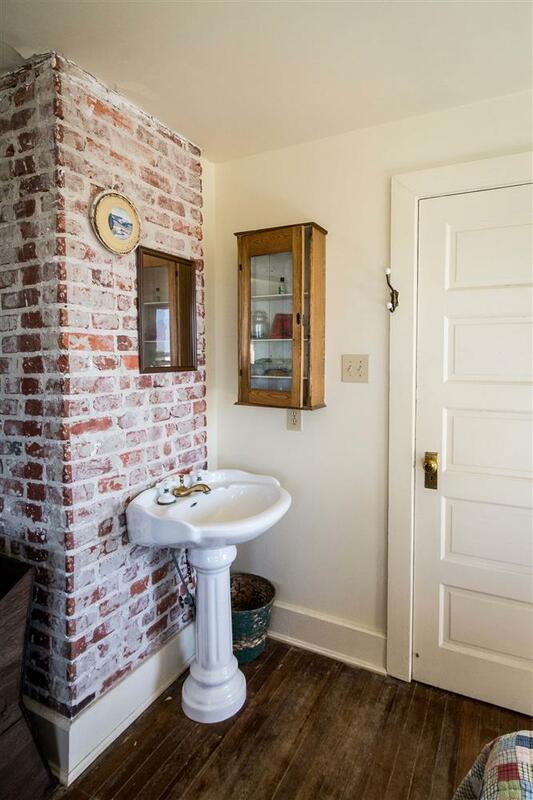 Wash basin with antique items. Shot taken of the front of Wash Woods, prior to the replicated screen porch design that now exists. 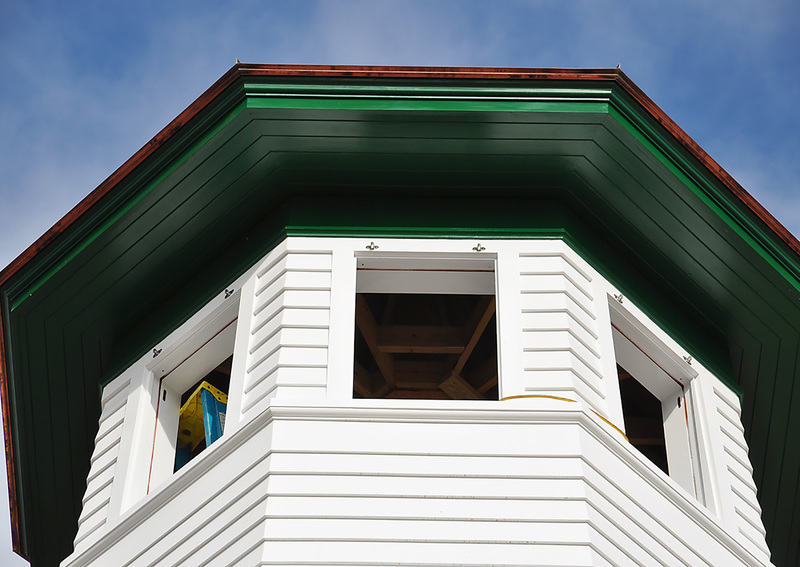 Screen porch was replicated to match the original plans with removable screens.